Founded: 1860s (unofficially). A sign on the gate dates it to circa 1894. Number of burials: more than 500, according to Findagrave. Surrounded by white picket fence, the Calistoga Pioneer Cemetery climbs a hillside facing Highway 128/Foothill Boulevard just outside of the small town of Calistoga. The cemetery has no parking, but it’s worth parking at the side of the road to explore its beautiful old stones. A sign inside the gate displays a modern map and a list of interments. Someone maintains a flagpole there and the cemetery is well kept up and lovingly tended, with silk flowers on many of the graves. The cemetery contains 23 veterans of the Civil War. The majority of them have been confirmed as Union soldiers by Dean A. Enderlin, who maintains an extensive website on the subject. Most of the veterans were buried together in a Grand Army of the Republic plot, but others are scattered throughout the cemetery, buried with their families. Among those buried in the Pioneer Cemetery are two survivors of the Donner Party tragedy. In 1846, after taking a difficult route from Missouri through Utah, the Donner-Reed Party of settlers got trapped in the Sierra Nevada Mountains by a heavy November snowfall. In mid-December, as supplies ran dangerously low, some of the party went in search of help. Lovina Graves Cyrus was 12 and Eleanor Graves McDonnell was 14 when rescuers finally led them to safety in March 1847. Of the nine Graves siblings, six survived as orphans. Their father had perished during the initial rescue attempt. Their mother’s corpse was among those which had been partially eaten. The Images of America book on Calistoga by John Waters Jr. quotes some reports that their little brother was clutching her hand and crying when rescuers came. Wikipedia counters that it was one-year-old Elizabeth who held her cannibalized mother’s hand. These days, Calistoga is a little spa town 75 miles north of San Francisco, at the northern end of the Napa Valley. An ancient volcano left the area with rich grape-growing soil and natural hot springs, some of which now provide thermal baths to visitors. Other attractions include a geyser that shoots skyward every 30 minutes and a forest of petrified trees. 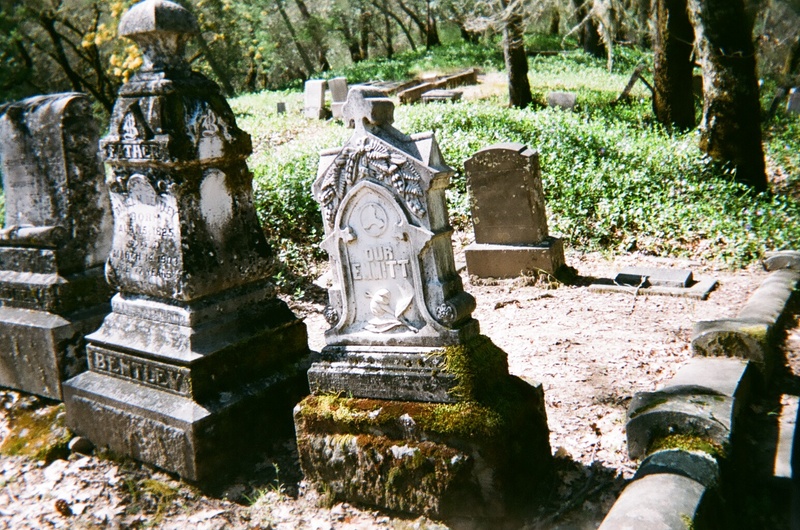 This entry was posted in Cemetery of the Week and tagged Bay Area cemeteries, California cemeteries, Calistoga Pioneer Cemetery, pioneer cemeteries. Bookmark the permalink. I would like to make a correction . First there are TWO Calistoga Pioneer Cemeteries in Calistoga, CA.. They are BOTH called Pioneer Cemetery, but on a Google search map they are called “Old ” Pioneer Cemetery where the White Picket Fence is and where the photos about this article was taken which is on Foothill Rd. with no address, but the White Picket Fence and the Gate are visable from the road. Google it. It is closer to the Pertrified Forest Rd. The other Pioneer Cemetery is further South, where Foothill becomes St. Helena Hwy. North. The address is 3601 St. Helena Highway North , Calistoga, CA. I do hope this helps ! Thanks so much for clarifying that, Jennifer! I knew about the other graveyard in the state park, but I thought it had a different name, something to do with the family who owned the mill. Google-searching it just now doesn’t turn anything up — and Findagrave only recognizes one Pioneer Cemetery in Calistoga. I love a mystery! I’m looking forward to visiting it the next time I get up to Calistoga. You are welcome Loren! The phone number you show of (707) 942-4575 is for the Bothe-Nape Valley State Park, the address (correction) is a 3801 St. Helena Highway North, Calistoga, Ca. Their “Pioneer Cemetery” inside the Park, is primarily that of the Tucker Family who were a Pioneer Family of the area.